Filet Relay is a 1-vs-3 minigame found in Mario Party 2. The minigame is set in an icy world with the players dressed like penguins (or acting like them). One player has to bring the fish to the end of the race alone while the other player in the team has to pass the fish to the next player in the team and the next until the player reaches the end of the race. At the beginning of the race, there is a big icy rock the middle of the lane. The next one has two snowmen throwing snowballs at the entrance and a zig-zag lane that one of the players can bump easily to the walls, and last there are some slopes and some snow men throwing more snowballs at the near end of the race. If the player waddles too much, the player might fall. Additionally, getting hit by a snowball squishes a player and knock them backwards, likely causing them to lose. 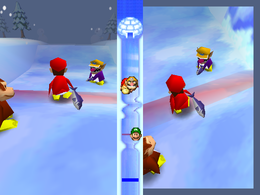 If one of the players reach the end of the race, that player wins and is greeted by other numerous penguins (including the other two players if the player are on the team of three). In the Mini-Game Coaster, the lone human player always plays against the team of three. Game Rules – "It's a 3-on-1 penguin race! Be the first to throw the fish to your friends at the finish!" Advice – "If you waddle too fast, you might fall down! When you start to slide, it's time to slow down!" This page was last edited on May 29, 2018, at 11:06.